Just in case you are wondering, I did create art yesterday, still ‘on the wagon’ I just didn’t get a chance to post it. I am going to be offering some smaller scale original works, on 185lb watercolor (acrylic) paper that will come already matted. It’s so fun to own original work but not always a practical choice with today’s economy. 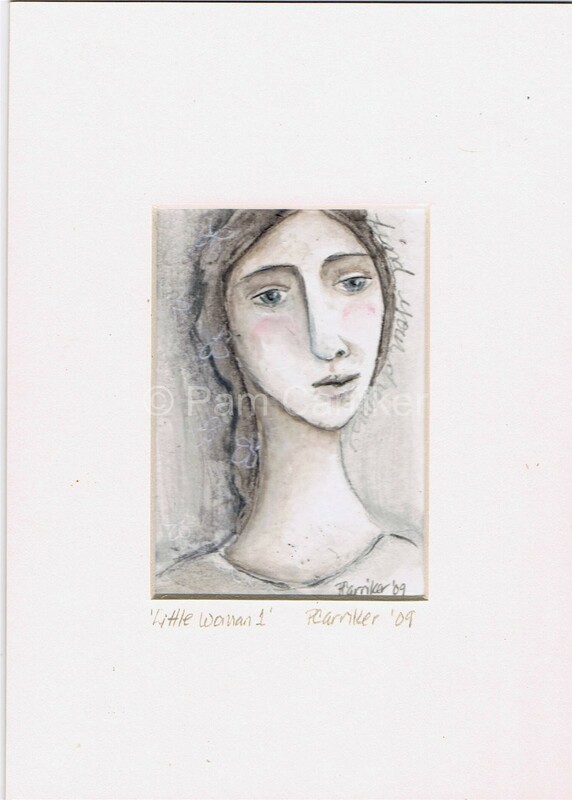 This little lady is the first of a series of ‘Little Women’ that will each be numbered. It is ATC/ACEO size (2 1/2 x 3 1/2) and is matted to a 5×7 size. This size will be stamped with all of the info just as an ATC, but can be easily slipped into a 5×7 frame for instant, wall art. These will be available in my Etsy Shop. Now back to finish my Valentine’s Day cookies. Love to all of my sweet readers, have a lovely day! Gorgeous Pam–like the matte with it as well, looks great together! Wonderful painting! I love little pieces.